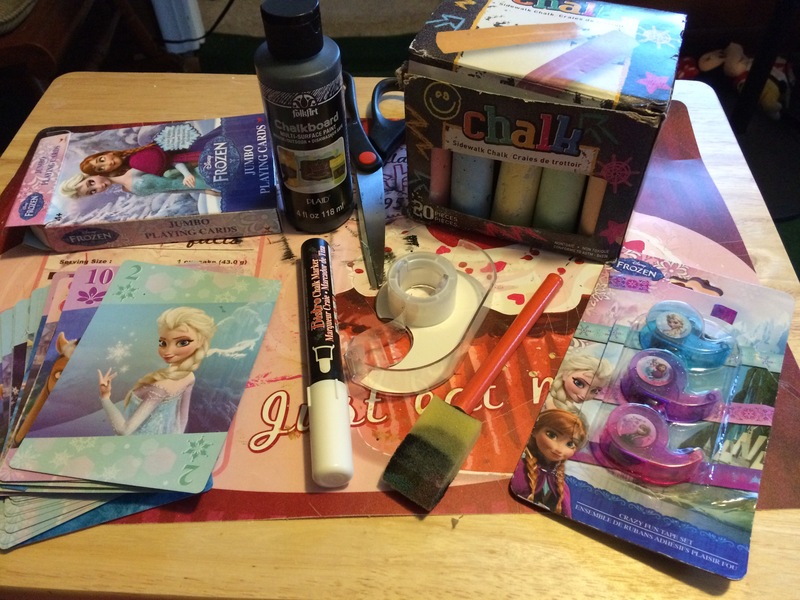 I don’t have to mention that you are going to be seeing to much “Frozen” theme crafts around here for some time. That’s because I’m planning my daughter’s 2nd Birthday Party. What a good Reason to Craft! I’m the type of person that thinks… “If I can do it, why buy it?”. So, I’m making almost everything myself, including these cute little food cards. I really loved the chalkboard thing, so I did them like that too. The best part is that if I change my mind about a food, I can just erase it and write the new food to serve. Well, whithout more to say, let’s see how to make them. Cardstock: The one used to make posters or in school. I bought the white one at Dollar Tree, but you can also find it at Walmart or craft stores and Office supplies. 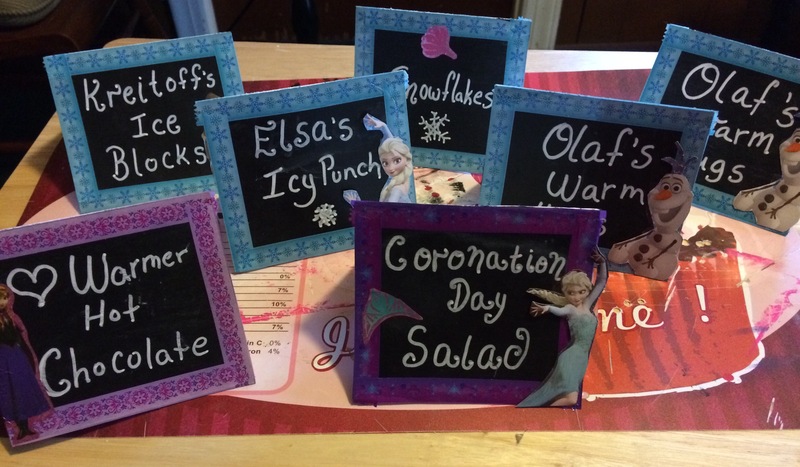 Decorations of preference: I used some “Frozen” tape that I found at Dollar Tree, Cut the characters from a “Frozen” playing card set also found at Dollar Tree. You can use stickers or whatever you want. Cut the cardstock in 5″x10″ pieces. And bend them at the middle (like a card) to make it stand. Paint one of the outer sides with the chalk paint and let them dry 1 hr. Paint it again and let cure for 24 hrs before continuing with the next step. Cover the painted area with chalk for conditioning. Wipe it with a wet towel. Start decoration. Make a frame with the decorative tape. Cut some character from the playing cards and tape it in any place of the food card that looks good for you. I prefer in a corner. Write the food name with the chalk marker and, voilà!, you have a hand made food card. I tape everything instead of gluing it because this way I can take out the decorations and reuse it with another theme. Hope you like this post and don’t forget to comment and share it!